or ready to use in the SHOP. This CDI only does the ignition task, it doesn’t use any safety like neutral and sidestand. Connect directly Neutral switch wire to Neutral indicator. Printed Circuit Boards and Ready to use CDI are available for sale ! 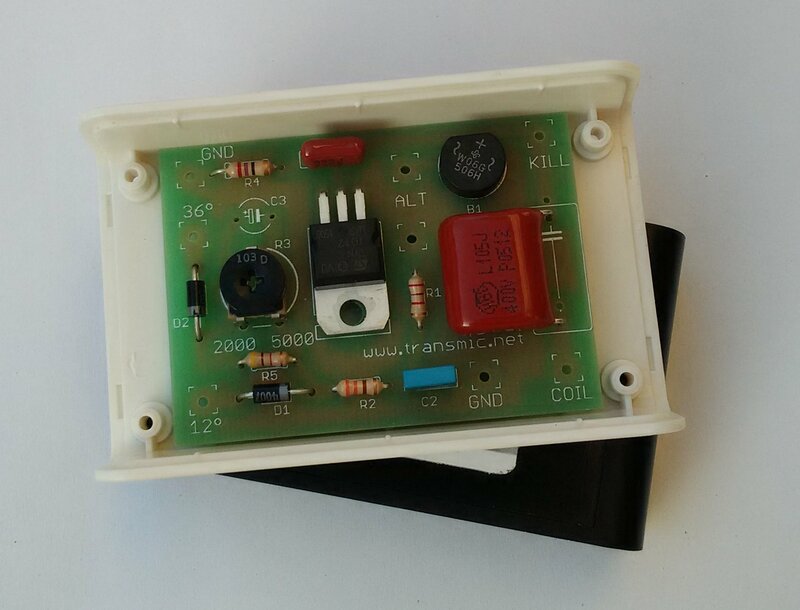 This circuit replace the genuine CDI. The charging coil produces a alternative voltage around 50Vac at idle to 200Vac at high RPM. This tension is rectify by the bridge B1, and loads C1 to a average voltage of 270Vcc. The 12° pickup (white/green) is used for idle and low RPM while 36° pickup (white/red) is used for high RPM. At startup and idle, positive pulses coming from the 12° pickup goes through D1-R2 then trigger the SCR T1. T1 discharge the energy stored in the capacitor C1 into the primary of the ignition coil, which delivers high voltage to the spark plug. At higher RPM, the positive pulses coming from 36° pickup goes through D2, R3, R2 and trigger the SCR. There is a interesting video describing how a CDI works. This CDI doesn’t have seamless advance, it jump directly from 12° to 36° BTDC. Start tuning with R3 at the maximum value (totally screw) which is equivalent to 5000RPM then slowly unscrew it to lower the resistance, therefore the RPM where it switch. But not negative then positive! If the pickup is not internally tied to ground inside the stator, you can reverse the polarity (NP to PN) by crossing the wires. D1 suppress the negative wave. D2 allows the positive wave to pass. Never run the engine if the exit of the CDI is disconnected from the spark coil or if the ground is disconnected (PAD1 or PAD2 not connected) otherwise the tension rises over 1000volts and destroy the SCR. Never run the engine without any spark plug: due to the high secondary voltage, it is possible to damage the internal insulation of the secondary coil. This simple unit is design for XT, which have 2 pulsars: one for idle, one for middle/high rpm. KLR and some others bikes have only one pickup for middle/high rpm range and there are some electronics inside their black box to delay the pulse at idle. I disclaim all responsibility !! If it’s ok, well done! you made a success of your first electronic ignition. You can use it to verify that your problem is a faulty CDI and as a spare unit. The pulse from second sensor (sensor A and magnet A on the left drawing) is early 12 ° before TDC. (Reminder: the TDC is finds when the sign like a H engraved on the rotor is view by the small opening on the left crankcase.) The advance is sufficient to start the motor straight. ESTA INTERESANTE ME PODRIAS MANDAR EL DIAGRAMA ELECTRRICO. I’d be interrested to make on for my DR125, how do you connect it ? Some modifications to do ? As you have only one pickup, connect it to GND and 36deg inputs. You pointed the connector [P-Br] on the schematic but it could be the other connector on the right too: [Bl-G] I don’t know ! Check what wires goes to the pickup that look like that. Bear in mind that polarity is of the most importance to get the positive pulse in the first place. or connect GND to G and 36 to Bl. Wow, this design and information may be exactly what I need for a CDI replacement on my Suzuki GN400. The GN400 has two trigger pickups, one at 10 degree BTDC and the other at 35 degree BDTC. The trigger pickups have single wire from each and ground at the mount plate. I like the idea the transition from the 10 BTDC to the 35 BTDC pickup is automatic and adjustable for the RPM. I have very good mechanical skills, I have done all my own work on my cycles for 35+ years. However, I have never built an electronic device. I do have a wiring schematic for my GN400 if that helps to determine how to best apply this CDI design. As you described it, The Suzuki GN400 pickup wiring is exactly the same as Yamaha XT600 so the connection is straightforward. Connect the 10deg hot wire output on the 12deg input. The 35 on the 36 deg input and connect the common ground. But keep in mind that Suzuki pickups gives a NEGative pulse first ! As my CDI use the POSitive pulse, this one come later (less then 10deg BTDC, less then 35deg BTDC) the advance will be lower than with the genuine CDI. Forgot to mention. I also have a CDI from a Suzuki SP500 that I thought may work as it is also an AC powered CDI with only one tripper pickup. However, it needs a trigger pickup with two wires, to ground at the CDI. The GN400 trigger pickup has only one wire, and it grounds at the pickup mount plate at the magneto. So I am not sure it would be adaptable to the ignition on the GN400. The common wire can be grounded on pickup side or CDI side, that doesn’t matter. i have a Hero honda cbz of 1999 model, which is 4 stroke single cylinder, 12 v ac (battery). the CDI is dead, No-where i am geting it. Please help me. What type of ignition box is it? TCI or DC-CDI or AC-CDI ? if it’s AC-CDI try the analog one. sur la dernière image de cette page ou sont les 12 et 36 degrés? Je n’ai jamais résolu ce mystere non plus ! Comment 7° et 13° deviennent 12° et 36° ? Comme les capteurs analogiques reagissent avant que l’aimant soit pile en face, il y a forcement une difference de qq degres mais quand meme…. Original CDI circuit. Analog ignition timing. Yamaha YZ80-125 2T module dismantling result. Will this circuit works for honda cr125 1996? Hello, I would try making this at home but the thing is, my low voltage AC supply for the lamps outputs 6VAC (5-9 actually) with 17W power output and the charging coil for the spark has direct contact from the black coil to the spark with breaker points for triggering. Do I connect the low voltage coil on the side where the 250VAC is on the schematics (alternator) and will it power up the PCB or is it too low power? A CDI need a high voltage to work: 100 to 200Vac. not less. Is the coil connected to +12v on one side and to points on the other side? Then it’s a TCI. Internal resistance of TCI coil doesn’t work with CDI boxes. Well there are 2 coils, one which makes high voltage for the spark (up to 8kV) going to spark on one side and through a capacitor on the points, so it discharges everytime the points break the circuit. There is another coil opposite which makes around 6VAC for the front and back lights. So not 2 charging coils but 1 and 1 for the lights. I was thinking of converting 6VAC to DC and stepping it down to 5VDC and then making a PCB with low voltage chips to be similar to this one – a fixed slightly adjustible advance curve (maybe with two steps at 2 different RPMs; but not really needed since the motor i have already goes from 1.000RPM – 10.600RMP somewhat smoothly on 15° preset with points). I would like it to run on 6VAC, the original charging coil and the original breaker points because this way I wouldn’t need to switch it out. But then comes the problem with lights, if it would take up much power I couldn’t have the lights on then. You don’t answer my question! in Kettering ignition there are points and capacitor. in high tension magneto there are points and capacitor. All I can say is micro-controller don’t draw a lot of current so using 6Vac rectified in 5Vdc will work without noticeable loss for the lamps. 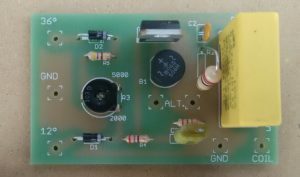 – how do you get 200Vac for charging a AC-CDI capacitor? I will not process to describe a magneto to AC-CDI conversion as it’s far beyond the subject of my web site and it’s not of a general interest IMO. Good luck in your project. Oh sorry for not replying, the motorbike is a small one with flyback magneto ignition and no battery. So the flyback integrated magneto coil and ignition coil would have to be switched out for a stepped up magneto ignition (seperate charging and ignition coil) right? Thanks for the tip on the page, got a wider view on the types of magnets and coils, very appreciated. Also thanks for the idea in the first place. It’s still unclear what your goal is! – install a AC-CDI ? => you don’t have any charging coil, the magneto coil cannot act as a charging coil. – Replace points by transistor driven by a controller? => no matter if it’s flyback or stepped-up magneto ! You must keep the points to give the timing to a controller than the controller trigger a transistor that switch off the current in place of the points. Je possède un Yamaha 125 XT de 1986, similaire pour l’allumage au 125 XT de 1982 pour lequel vous avez fait un test positif avec votre boitier AC-CDI Analog. Par contre, il ne me semble pas qu’il y ait 3 fils white/green, white/red et green venant du sensor mais seulement 2 fils green et white. Dans ce cas, comment brancher ces 2 fils vert et blanc sur le CDI ? quelle couleur va sur ground et quelle couleur va sur 36° (car j’ai compris que lorsqu’on a “only one pickup” on utilise le 36° et pas le 12°) ? Effectivement selon les années, Yamaha a utilisé 1 ou 2 capteurs! quelle couleur va sur ground? Quelque soit le fil raccordé a GND, le pickup va fournir un signal MAIS la polarité va changer ! Pour le voir, le mieux est un oscilloscope mais vous devriez y arriver avec un multimetre ANALOGIQUE en position millampéres. En kickant, vous devriez trouver quel fil grounded permet de fournir POS /NEG sur l’autre fil. Merci pour cette réponse. J’essaierai effectivement avec un multimètre analogique. Sinon, je me dis qu’il suffit de tester directement sur la moto, en essayant les deux possibilités (en inversant les deux fils sur GND et 36). Il doit y avoir un cas où la moto démarre mieux ou fonctionne mieux ? Sinon, autre question, je comprends que ce CDI est avec une avance à l’allumage fixe, quelque soit le régime moteur. Est-ce exact ? Cela a t-il un impact sur les performances du moteur et donc de la moto (couple, vitesse de pointe,…) ? Hello, Ii Test it with a Yamaha TTR600 4T, at the moment it does not work, the original CDI is 12V powered by a regulator, should there be any problems? I don test good signal of pikup. ac-cdi cannot replace dc-cdi….. !! you do not have DC-CDi to sell? It work for my yamaha 135cc 2 stroke..but i want rev limiter for my bike..!! Thx thierry,,,and sorry for my english..
Is it a Yamaha RX135 2strokes? You cannot have a TRUE rev-limiter on those VERY simple analog CDI. (You need a digital one). But you can try to increase C2 to 4.7uf or 10uf. It will lower the advance at 10000rpm and smother the engine. Thankyou for your response. Yes is the same bike. And surely i will try your advice. But I don’t have enough data to draw the ignition curve. So that my bike runs very badly. I think It needs trial and error , but I won’t give up before trying again. Yamaha RX135 has a advance curve from 3deg at 1500 until 20deg at 5000RPM. But you also have to use the right pickup position and the right polarity. A oscilloscope is useful the check that on the original CDI before the swap. I have a Kawasaki KLF 185 and the CDI box is the second weakest link in the 4 wheeler only behind the valve train. The unit has one pulse pickup coil and from what I have read here I would hook up the pulsar (2wires) to the the 36 degree BTDC and ground the other wire. That being said how does this start with the spark being retarded so far? Or am I missing something in the design? If this would work for my unit do you sell the entire kit or is this a build it yourself project and scrounge up the parts? Any help is appreciate and thank you in advance. You read well and don’t miss anything. The magic comes from the VR (Variable Reluctance) pickup type. On those ones, the voltage change with RPM and it’s where the advance is changing. As I stressed, this simple CDI works best with a positive first pickup. Kawasaki is generaly a negative first sensor, meaning the positive wave is latter = bad timing. The good thing for you is the pickup is separate so you can reverse the 2 wires hence the polarity. it “should” work but may need to reverse the 2 wires for the pkp. It is sold already built in the shop section here and on ebay. It’s a DIY thing, you have to sold the wires by yourself. As you said the best way is to salvage the wires and connectors from the genuine broken unit.